Every year new trends emerge in terms of design, that change the way employees and designers use and look at their office space. Therefore, this blog will look at what 2018 has to offer and what design professionals predict will be popular for the new year. We will also be adding our own personal predictions, based upon our own experience within the industry but also based upon what was popular with our customers last year. The focus now is on our ability to improve office space for everyone, to recognize the individuals value in the work place. The theme for 2018 office design is “vitality:” taking the office space beyond being a place we simply tolerate, to becoming a place where we feel re-energized and full of possibility. 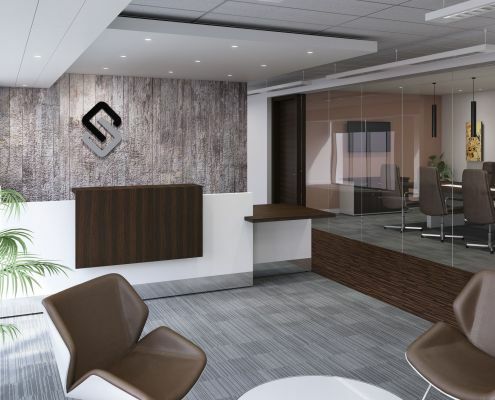 Combined with rapid technological advancements, this has allowed office interior designers to move away from the traditional and welcome a world of creative inspiration. Employee well-being and the individuals experience now plays a big part in terms of office design. 2017 saw the rise of nature into the office with biophillic design elements and there is a strong prediction that it’s popularity is not slowing down in 2018. From rooftop gardens to water features, biophillic design and its positive impact on employee well-being has become a crucial factor in office design. This trend is rapidly growing in popularity especially in city centre office locations where nature is not easily attainable. Towards the end of 2017 we helped refurbish Geoffrey Miller Solicitors office space, this was a great project and one that was very exciting to work on. 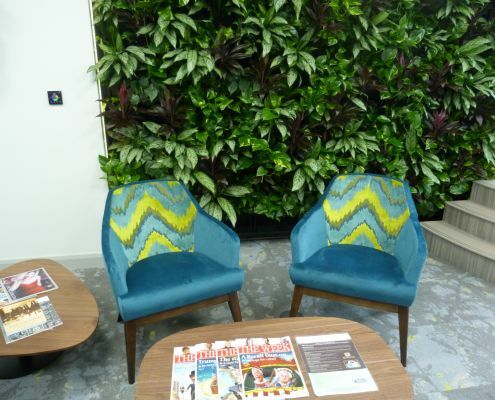 The Geoffrey Miller team decided to place a living wall in their reception area, the living wall looked amazing especially behind the vibrant furniture we had supplied the team. (You can see an image of this above). From this installation we had no doubt that this trend would continue to grow in 2018! We also created a Pinterest board last year titled Add a little green to your office, as we continued to notice the rapid growth in nature inspired office spaces and biophillic design elements. We hope that this Pinterest board inspired and continues to inspire designers internationally. However, this trend goes far beyond just adding a few plants to your office, it has now been scientifically proven that plants and nature improve productivity and can boost employee morale. Andy Baxter, founder of Internet Gardener, says” Bright,green leafy plants make people happier and there have been a lot of studies recently about how plants naturally improve productivity. Technology has of course driven this trend and enabled employees to work from anywhere within the office, with technology being easily accessed from many spaces located through many offices. However, employees can now just as easily complete their work from home- so employees are faced with the task of how attractive is it for your employees to come into work every day. For many of today’s young professionals, the workplace is more than somewhere to go for seven hours a day, it is where they meet friends, socialize and can feel valued. Indeed, not just for millennials but for many employees the work place can often represent a better and happier environment than their home one. 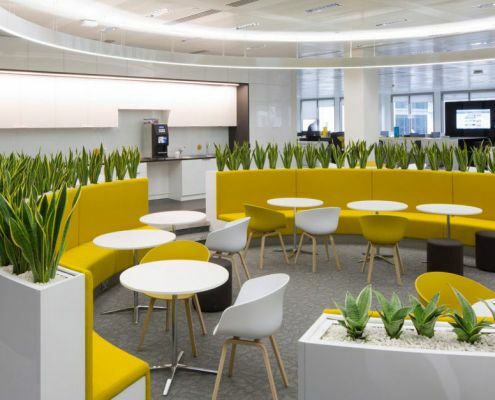 Today’s workplace is all about offering a more holistic experience to staff and ultimately office design is now all about designing that valued employee experience. Throughout 2017 the team at Bevlan Office Interiors have worked on many creative office/ break out area projects. These projects are very exciting as there are no rules and the more creative the better for some clients. 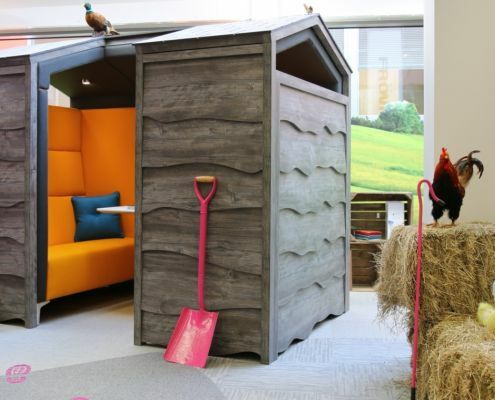 For example, we have worked on offices that have included office huts, beach huts, caravans, phone boxes, beach chairs, grass areas, vibrant bean bags and sofas and ping-pong tables. Visit our project page here to view some of the creative projects we have worked on. Or click here to go straight to the breakout furniture we offer. 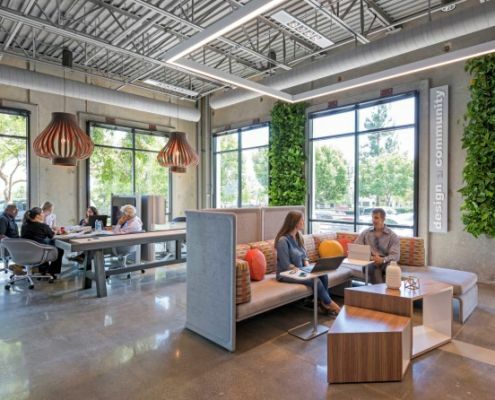 Office designers are incorporating elements of the outdoors and bringing them in to the office. By mixing textures and materials, designs are being created that look cohesive, visually interesting and engaging. We know at Bevlan that the right combination of fabrics can bring out new dimensions to a sofa or chair. While a combination like wood and stone works really well with the biophillic design trend of this year. Out of the Industrial Design of 2016 came the cement craze of 2017, no longer relegated to the outdoors you’ll find cement in homes, restaurants and of course offices. The greys and light coloring of this office furniture, broken up with pops of greens from office plants can create a stunning look that stands out as modern and industrial. As we continue to become more and more health conscious, especially as we enter a new year. ‘ The new year, new me’ social media posts are hitting your screens and the gym memberships are being bought. Health and wellness is not just a private consideration, wellness in the workplace is a huge point of discussion these days. Rightfully so as many of us have chose to spend most of our life in an office! Which can be an uplifting,progressive and vibrant experience, or it could be mundane, monotonous and depressing. Wellness isn’t just about physical health and taking the stairs at work, it’s about being happy in your body, mind and soul and feeling like your workplace allows you to thrive and succeed. We can provide you with comfortable furniture that can give your employees the opportunity to escape, rejuvenate and motivate them when they need it the most. You probably have now noticed the increase of on site gyms in office locations, in office yoga classes, massages and on site smoothie bars. These extra elements to the working day can not only motivate your employees, but also aid with building employee relationships to benefit their mental well-being at work. Staying behind for that Friday afternoon yoga class at work may just leave you feeling a lot more comfortable with the people you see everyday. 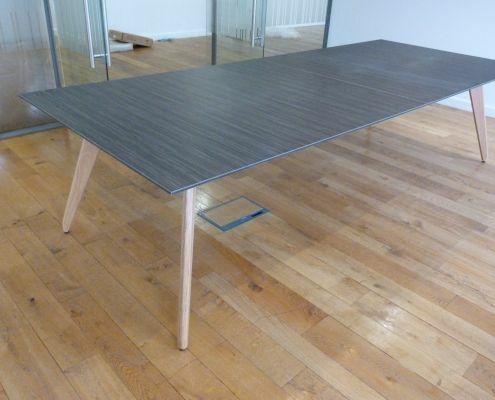 As employee health and well-being is such a crucial element, the furniture industry has adapted to this demand. At Bevlan Office Interiors we can provide you with furniture that enables greater movement, positively benefits your health and can even give you that change you need to your mundane office routine. We offer sit stand desks, ergonomic chairs and stools and even free ergonomic assessments. Start to create your employee wellness program with Bevlan by your side. Dynamic spaces are not a new trend for 2018, dynamic spaces have been around for a couple of years now but it is only now that people are starting to take notice of how popular they are. 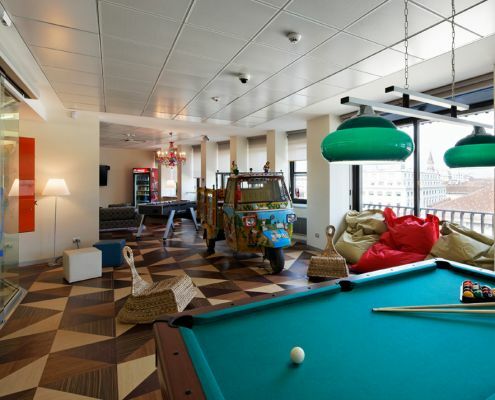 So what is a dynamic office space you ask? Dynamic office space refers to an office concept which gives the employees the flexibility to work however they want, they are not confined to a designated desk. 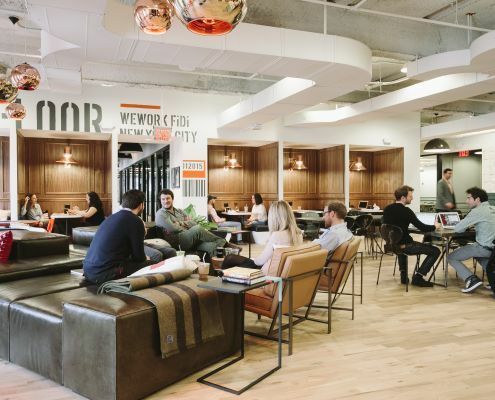 As renting or buying office space isn’t exactly cheap and is still at premium prices in many parts of the country, companies are thinking about how to use the space they have for multiple uses. Here at Bevlan Office Interiors, this is exactly what we do best and pride ourselves upon looking at office space differently! With over 30 years experience in the industry, we guarantee we can design and guide you on the best ways to use your office space in the most effective way. Dynamic spaces are an amazing feature to a modern office and we can provide you with light weight, multi functional furniture, that is easy to adapt for your own needs. With flexible furniture like sit stand desks, flip top tables, hot desking and movable walls, employees have a wider range of working options. Today’s office workers need offices that can adapt to their needs depending on the task at hand, that’s where we can help! Make sure you take a look at our website for any further information.